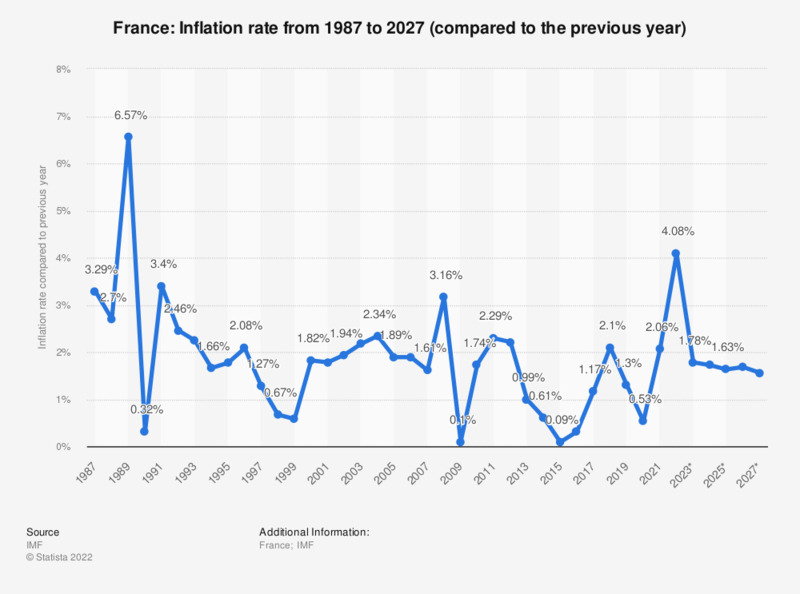 The statistic shows the inflation rate in France from 2012 to 2017, with projections up until 2022. The inflation rate is calculated using the price increase of a defined product basket. This product basket contains products and services on which the average consumer spends money throughout the year. They include expenses for groceries, clothes, rent, power, telecommunications, recreational activities and raw materials (e.g. gas, oil), as well as federal fees and taxes. In 2017, the inflation rate in France was at about 1.17 percent compared to the previous year. France is among the top six of the countries with the largest gross domestic product worldwide, behind the United Kingdom, Germany, Japan, China and the United States. It is thus one of the leading economies worldwide. Its economy mostly relies on the services sector with almost 80 percent, agriculture making up only 1 percent of the economy and the industry sector the rest. These three sectors are typically seen as the main pillars of a country’s economy. France is also among the leading exporting countries worldwide and the leading importing countries worldwide. Both France’s exports and imports have increased over the last few years. Its trade balance (a country’s exports minus its imports) has been decreasing significantly over the last decade, which means the value of France’s exports was considerably lower than the value of its imports. France’s main exports include wine, meat and other food products. Its main imports are manufactured goods, among other products. As for the national finances, the national debt of France has been rising steadily and it is thus counted among the countries with the highest public debt, albeit lower in the ranking. Nevertheless, the standard of living in France is quite high, its life expectancy is among the highest in the world, and the employment rate has been steady, or even rising slightly, since 2009.